Decorate your garden for back-to-school and autumn with stylish cats! Only $16.88 per flag with your discount, including shipping, handling and tax. 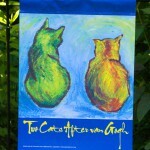 Now through the end of August, 25% off the purchase of either Impressionist Garden Flag or Two Cats After van Gogh Garden Flag. Each flag has a design on both sides. “Stanley With Apple” is on one side and “White Cat Reflecting” is on the other side, so you can show Stanley with his apple for early autumn, then change it out with another flag for October and winter holidays, then next spring put it out again with “White Cat Reflecting“. I also offer this art as a print on paper, canvas as well as greeting cards and note cards. In August when my felines and me watched the neighbor kids running for their bus in the morning on the first days of school I remembered this sketch of Stanley from the previous June. It not only had an apple, the universal symbol for “school”, but the background looks like one of those green chalkboards with chalk dust all over it! It’s time for Back to School! The original sketch was the daily sketch for June 22, 2012 and I reprised it in June 2014; on the same day in June 2012 I posted the original photo I used for this sketch, taken on film in 1990 or so. You can see the sketch below and the photo at right. I originally took that photo as a reference for a future painting, and like so many others the photo remained packed in my boxes of photos for years, unseen, except that the image itself stayed with me. In 2012 when I’d reorganized my photos I’d dug past it in one of the boxes and remembered it. When I decided I needed to post it here as a vintage photo I knew exactly where it was, and then later that day decided to use it for my daily sketch. It’s tiny, 5″ x 7″, and the paper is rough so the details are loose but I think it captures the composition; there are things I would change, there are always things I’d change, and perhaps someday I’ll do the larger painting where I can capture all the details and those things I would change. But for now, I’m very happy to see this as a sketch. To think I took that photo nearly 24 years ago, before I had done most of what I have today. 24 years ago my rendering would have been quite different, or 10 years ago or last year or even yesterday, literally and metaphorically colored by my experiences in life and as an artist, and even the quality of sunlight coming in the window. And 24 years ago Stanley was about 9 years old, not even halfway through his 25 years. 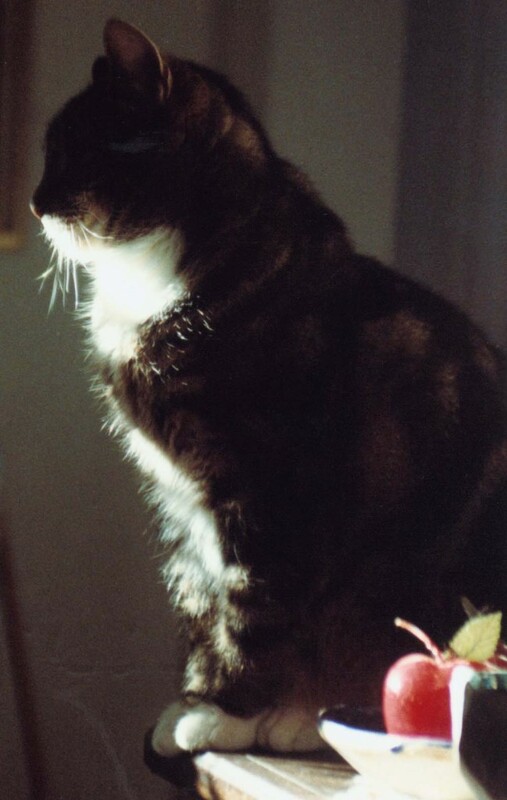 My white cat was endlessly inspiring to me, and I would need two lifetimes to recreate all the images of her that I have photographed and saw every day. Sally was deaf and spent most of her days in her own little world in pursuit of her own happiness, which when possible included a rest, nap or long snooze in the sun. Here she alights briefly on the stool, reflecting the sunlight onto all that is around her while she reflects on the events of her day so far and just what is to be done next. 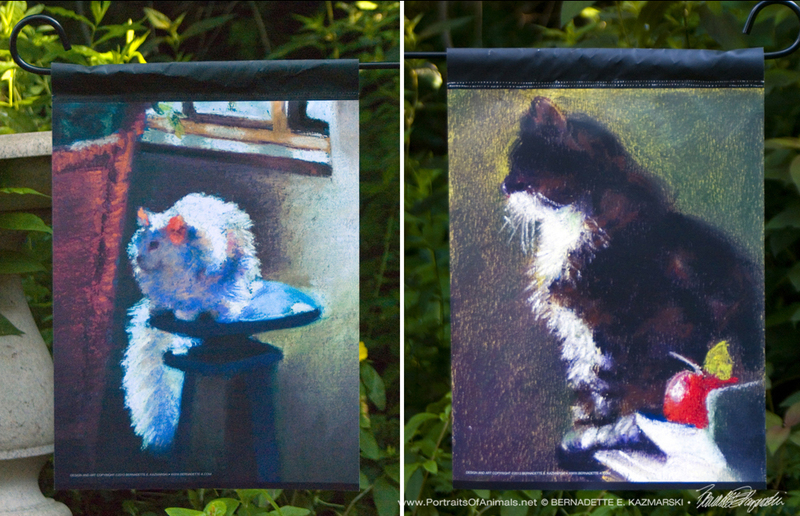 These “garden flags” are digitally printed on both sides of a heavyweight, durable indoor/outdoor woven printable fabric, and I finish by adding the rod pocket. (Bracket is not included.) Shipping is included. 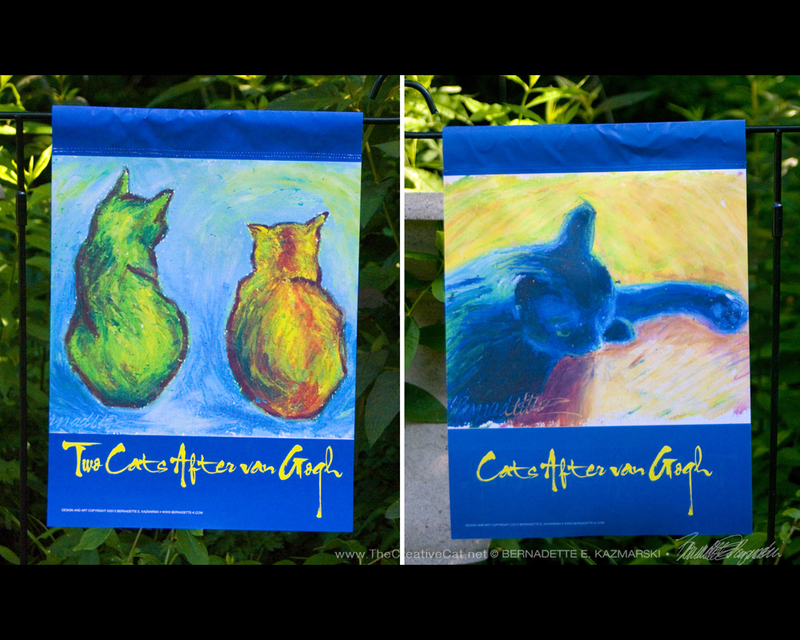 Each flag has a design on both sides, in this case it’s two from my “Cats After van Gogh” series of oil pastel sketches, with “Two Cats After van Gogh” on one side and “In Window Light” on the other. The fabric has a bit of reflection so I’ve added the original art so you can see the actual details. Flags are 11” wide x 15” tall and fit the most common garden flag bracket available, sold in most hardware and home renovation stores with a garden area. 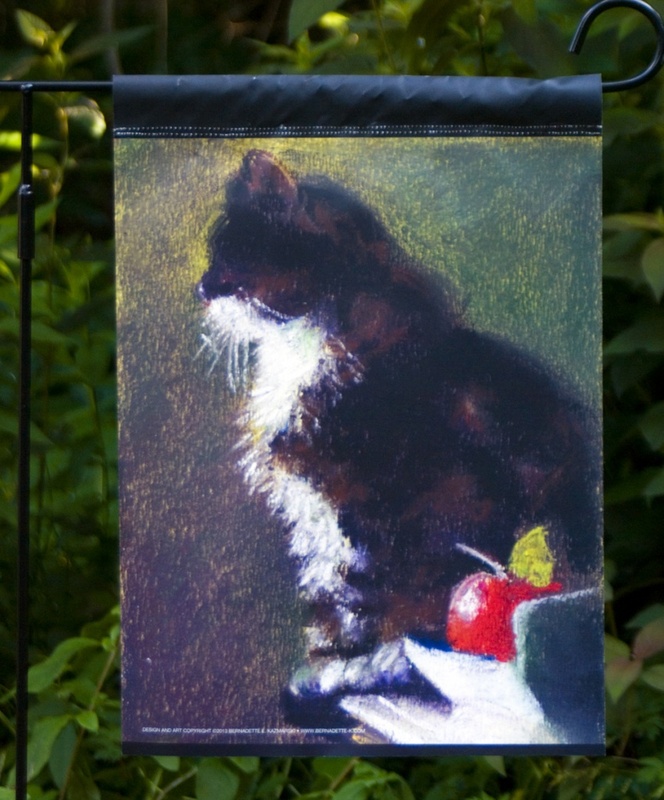 My garden flags are designed with images of my feline artwork, from the quick colorful sketches I create each day to my detailed fine art paintings. They are made locally to me and I can work closely with the printer and have smaller quantities made, and therefore offer more designs. I ship the garden flags flat so there’s no worry about excessive curling. Please ask about the brackets. 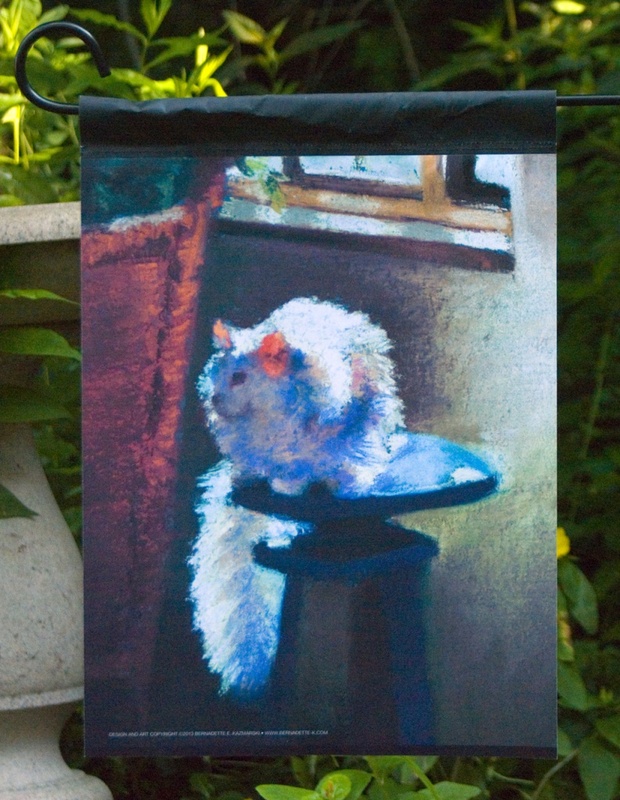 I’m so pleased this design won both a Muse Medallion and the President’s Award in the 2013 Cat Writers’ Association communications contest, and it was also one of the main inspirations for pursuing the idea of somehow, some way, printing my art on garden flags. And the bright colors and the blue on both sides of the flag are meant for your summer yard! I traveled with a friend in April 2012 to see the “Van Gogh Up Close” exhibit. Although it seems I love the Impressionists best, van Gogh is a step apart from the Impressionist styles we find most familiar in Monet, Renoir, Degas, Cassatt with his stylized forms and brilliant, often non-representational colors. I’d only seen a few original van Gogh paintings, and taking in an entire exhibit intended to show you van Gogh’s work near enough to touch and to see his influences filled my head with dimensional flower petals, rippling wheat textured in fields, dappled leaves seeming to move with the extra layers of paint—and colors! I closely studied the way he roughly blended colors into one another and what colors he used, the brilliant greens contrasted with the earthy sepia, lots of yellow and blue. All the way home on the Megabus I remembered the colors and shapes and textures, and wanted to work the same energy and form I saw in his brush strokes, visualizing oil pastel to layer and blend the strokes as an experiment. Arriving home in Pittsburgh just a few hours later I saw Giuseppe and Mr. Sunshine, just quietly hanging together on the landing, Giuseppe sitting upright, Sunshine loafing, and visualized exactly what I would sketch. Since then, when the pull of the textures and layers and colors draws me in, I’ve worked several other images in oil pastel in similar style. Oil pastel is not a popular medium, and I found it difficult to learn to handle. 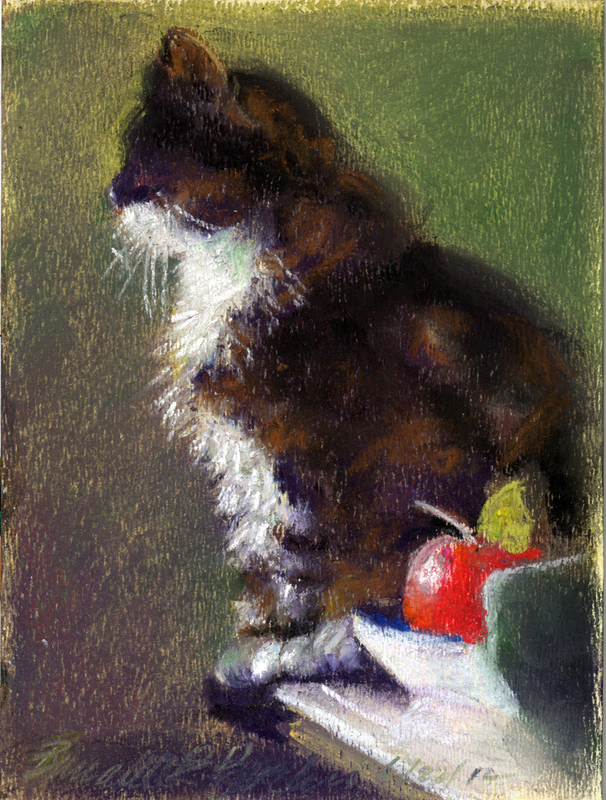 I’d actually done a few other landscape and still life paintings with them years ago, but put them aside in favor of my chalk pastels in my tiny crowded studio. Here Mimi lounges in the light from the window, slipping in under the mini blind. Who doesn’t know that posture of the vigilant kitty, not sleeping, just kind of hanging out and waiting for…well, humans tend to be pretty dull, but that gives kitties a lot of resting time. In the strength of the sun, all colors appear in her fur and on the old marble windowsill and the hot yellow sun outside the window, and I’ve no doubt Mimi enjoyed her nap. 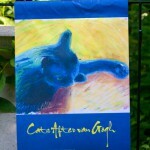 This entry was posted in cat artwork, cat merchandise, garden flag and tagged animal artwork, black cats, cat art, cat artwork, cat garden flags, cat gift items, cat merchandise, feline artwork on August 19, 2017 by Bernadette.